As we learned or remembered on This Day in Yankees History this morning it was this day in 2015 that the New York Yankees honored their long-time catcher Jorge Posada with Jorge Posada Day at the stadium. Posada's #20 was retired and a plaque was placed in Monument Park to honor him. With this day one year ago in mind let's remember a great Yankee of the past. Hip Hip, Jorge! 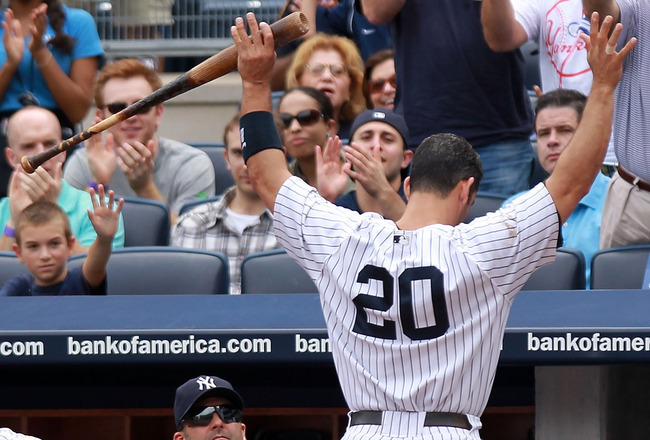 Welcome ladies and gentleman to Jorge Posada Day! Jorge Rafael Posada Villeta was born on August 17, 1971 in Santurce, San Juan, Puerto Rico to Tamara and Jorge Posada Sr. Posada spent 17 seasons in Major League Baseball, all with the New York Yankees, and helped open the door for the offensive minded catcher along with the New York Mets catcher Mike Piazza. Posada finished his career with a .273 batting average, 275 home runs and 1,065 RBI as a switch hitting catcher. Jorge was a five-time All-Star, five-time Silver Slugger Award winner and received four World Series rings as a member of the Yankees. Posada wasn't always the man we see before us today, at one time even Jorge Posada was a prospect. Posada attended Alejandrino High School in San Juan where he not only played baseball for the school but other sports as well. Posada was a shortstop in High School and did enough in his time there to earn a scholarship from Calhoun Community College in Decatur, Alabama. CCC recruited Posada without even scouting him and Posada accepted the scholarship without even visiting the school after his SAT scores kept him from going to a traditional four-year college. Posada was voted the best hitter in his first season, 1990, while earning the co-captain position as well. Posada's bat, rifle arm and attitude was enough to earn the attention of the New York Yankees who drafted him in the 24th round of the 1990 Major League Baseball First Year Players Draft. Posada signed for roughly $30,000 on a three year deal. Posada began his Yankees career as a second baseman but the team feared that he lacked the speed to remain as an infielder so the team began the move from second base to catcher in 1992. Posada was not happy about the transition reportedly but after a bumpy beginning he agreed to it and ended up flourishing at the plate while catching some lanky lefty named Andy Pettitte for the first time that season. In his first full season as a catcher Posada hit 17 home runs and knocked in 61 RBI in 118 games garnering a promotion to Double-A. Posada's defense behind the plate needed work, he committed 38 passes balls in 1993, his bat was good enough to earn a promotion to Triple-A with the Columbus Clippers for the 1994 season. Posada's season started out well as he had 11 home runs before a collision at home plate broke his left leg, dislocated his ankle and prematurely ended his 1994 season. Posada was recovered from the ankle injury in 1995 and found himself almost immediately in the middle of multiple trade discussions. The Yankees attempted to trade Posada to the Seattle Mariners for Tino Martinez before those talks fell apart. Just three weeks later the Yankees attempted to trade Jorge Posada and Mariano Rivera to the Cincinnati Reds for David Wells but thankfully the Cincinnati GM turned the deal down. Deals like this is what makes me wonder why people state that they want George Steinbrenner back or GM's like Gene Michael running the team again. This also goes to show you how GM's, managers and owners simply get lucky sometimes but that is another discussion for another post I guess. Posada was called up to the Major Leagues in 1995 and made his MLB debut replacing Jim Leyritz in a game on September 4, 1995. Posada was included on the postseason roster despite that debut marking his only game in the bigs and even allowed him into Game 2 of the 1995 American League Division Series as a pinch runner. Posada was back in Triple-A in 1996 before being added back to the roster as a September call up. Posada lasted just eight games in 1996 and was added to the postseason roster once again. Posada did not appear in the postseason in 1996 but he earned his first World Series ring in 1996 when the Yankees beat the Atlanta Braves in six games. Posada was handed the backup catcher position in the 1997 season as he quickly became the student of starting catcher Joe Girardi. Posada appeared in 60 games that season before their season was ended prematurely by the Cleveland Indians in the 1997 ALDS. Once again in 1997 the Yankees offered Posada in a deal along with Mike Lowell for Pedro Martinez of the Montreal Expos. Martinez was ultimately traded to the Boston Red Sox instead as the Yankees once again dodged a bullet with their soon to be starting catcher. Posada used the trade rumors as motivation for the 1998 season and it seemingly worked as he finished the season with a .268 batting average, 17 home runs and 63 RBI while catching David Wells perfect game on May 17. Another season, another postseason and another ring for Posada, his second of his career. Posada split time with Girardi in 1999 as well and once again won a World Series ring with the Yankees as he slowly saw his playing time increase. Girardi left the Yankees as a free agent before the 2000 season allowing Posada to become the full-time catcher in the Bronx. Posada made his first All-Star Game appearance after hitting .287 with 28 home runs and 86 RBI and won his fourth World Series as a member of the Yankees. Posada was right back in the Mid-Summer Classic in 2001 as well and was right back into the World Series as well when he came up one out short of his fifth World Series ring in pinstripes. While Posada didn't reach the World Series in 2002 he did make his third consecutive All-Star Game appearance and got a fourth nod in 2003. Posada was back in the World Series in 2003 after hitting the game tying hit against Pedro Martinez late in Game 7 of the ALCS but the team was unable to stop Josh Beckett and the Florida Marlins in the team's second World Series loss in three seasons. Posada finished the 2003 season in third place of the MVP Award voting behind Alex Rodriguez and Carlos Delgado after hitting .281 with 30 home runs and 101 RBI. While Posada rode the emotions of the 2003 ALCS after getting the big hit to tie the game he watched in the dugout in the 2004 ALCS when the Boston Red Sox came back from a 3-0 deficit to win the series and eventually their first World Series in 86 seasons. Posada hit free agency after the 2007 season and ultimately turned down a five-year contract offer from the New York Mets before re-signing with the Yankees on a four-year deal worth $52 million. Posada had the security of a large contract in 2007 but in 2008 he had to deal with a disabled list stint for the first time in his career. Posada underwent surgery in his right shoulder to repair a glenoid labrum that ended his season. This season was cut short by injury and was the first time in Posada's career that he did not see his team make the postseason. Posada entered the 2009 season healthy along with a slew of new teammates and broke in the new Yankee Stadium in a big way hitting the first regular season home run in the stadium. Posada was back from the shoulder surgery and finished the season with a .285 average, 22 home runs and 81 RBI before winning his 5th World Series in a victory over the Philadelphia Phillies. Posada's power was on full display in 2010 as the team looked to defend their crown and even became the first Yankee since Bill Dickey in 1937 to hit grand slams in back-to-back games against the Houston Astros. Posada also collected his 1,000th career RBI but could not collect his 6th World Series ring as the team lost to the Texas Rangers in the 2010 ALCS. Following the 2010 season Posada underwent an arthroscopic surgery in his left knee to repair a torn meniscus that forced him out of the catcher position and into the DH position for the Yankees, something that did not go over well with Posada. Posada had to watch as the Yankees signed Russell Martin to be their every day catcher and had to watch as former teacher, and current manager, Joe Girardi dropped him to 9th in the Yankees batting order. Posada asked to be removed from the lineup and told reporters he needed to clear his head and also mentioned he had some stiffness in his back as the reasons for asking out of the lineup. Posada was delegated to a bench role in August of 2011 but it earned him one more final trip to the postseason. Posada played well in the ALDS but the team lost the ALCS to the Detroit Tigers in five games as we all watched Posada on the baseball diamond for the final time. Posada reportedly received interest from five or six teams during the offseason before the 2012 season but the New York Yankees were not one of them. In January of 2012 Posada decided to announce his retirement from the game of Major League Baseball. Posada has rejoined the team as a guest instructor during spring training since his retirement but has rarely been back to Yankee Stadium outside of Derek Jeter Day and Jeter's final game in the Bronx. Posada is a legend, Yankees or not, and say what you will he deserves this honor of having his number retired by the Yankees. Not many players win five World Series or almost change a position for the better single-handed. Posada is a Yankee and now he will always be remembered as one. Congrats Jorge!